Jean-Georges Vongerichten’s JoJo Is Wonderful, But What Did You Expect? JoJo was Jean-Georges Vongerichten’s first restaurant in New York City. With that pedigree, how much more do you really need to know much more about it? The small, cozy Upper East Side bistro features intimate seating, low light, and a crowd of what I take to be regulars dining on the wonderful fare. It was the springboard for his dining empire. It’s a pleasure to eat there, especially since food there is such a steal: they offer a prixe-fixe $26 lunch and $38 dinner. Apologies in advance for the low light on the pictures, but the place is pretty dark, and I don’t like to use a flash – it’s rude to the other patrons. 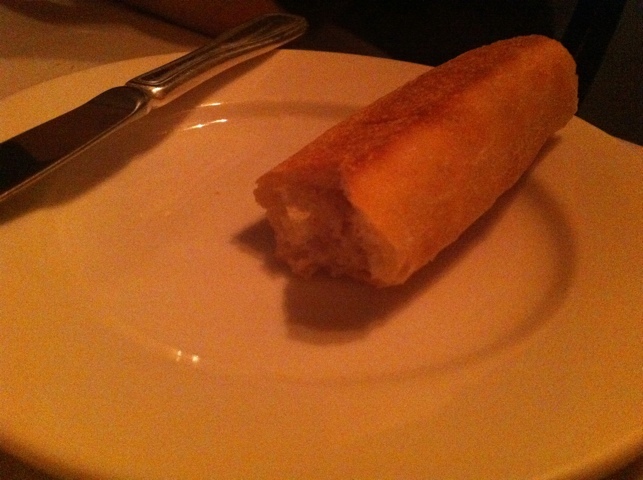 I can't believe I'm writing about a breadstick, but I am. Normally, I wouldn’t write about bread. Especially since amid the diet it is a huge no-no, but theirs was wonderful. Fresh, light, warm, flavorful. 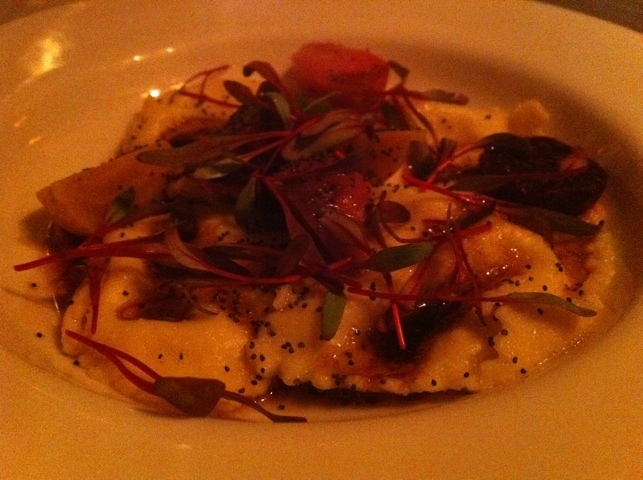 The three cheese ravioli... savory, wintery, delicious. I started with the ravioli appetizer. It’s stuffed with three cheeses. It is by far the best pasta dish I’ve had since returning from Italy. I don’t say that lightly. The pasta we sampled in Italy was overwhelmingly made from scratch (in fact we were treated to a cooking lesson at the Antica Corte Pallavicina, and the flavor of these ravioli me right back there). The pasta was fresh, with the barely-there crumble in the mouth that I notice in especially fresh made pastas. Tastes even better than it looks, and it looks good. I was convinced I picked the winner among the appetizers. Guess again: the missus did, selecting the crazily delightful tuna roll. The tuna is served in a warm, bread-like starch. 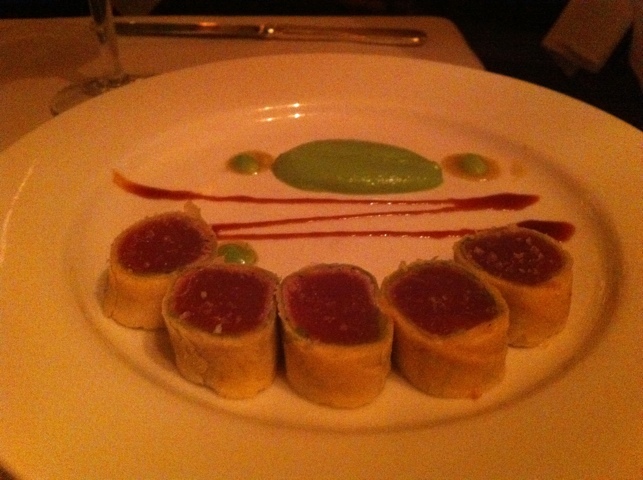 The tuna itself doesn’t seem raw, it also is a bit warm – although I may be wrong. Either way, the result is what amounts to an adult version of pigs in blankets. It was fun and delicious. The green sauce is a soy bean emulsion, and adds a touch of hot spice to the roll if you care to dip it. 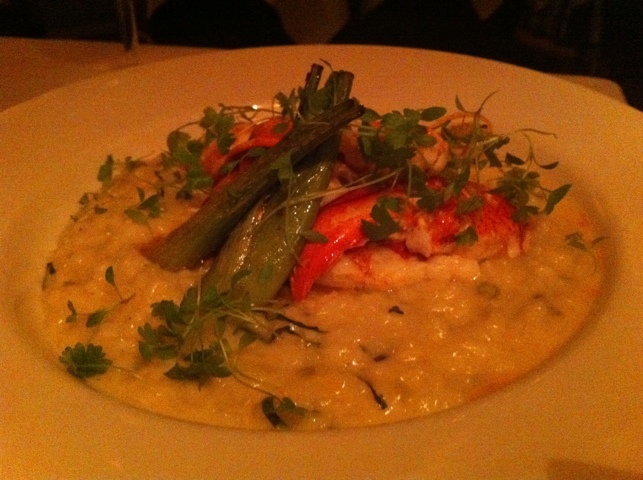 From there, the missus selected the poached lobster over lemon risotto. If it sounds good, trust me, it tastes better. Rich and delicious. Who doesn’t like lobster? 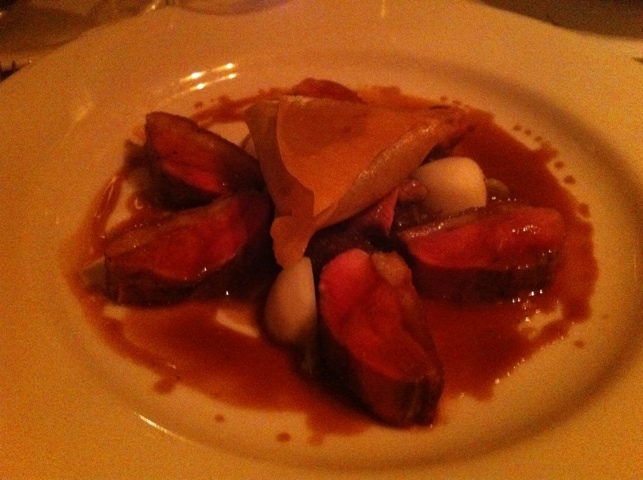 The pastry-encrusted duck in the middle was really something. Crunchy! I indulged in the dual preparation of duck. It is served in medallions as well as a ground preparation baked in a brick pastry. The crispy shell is very alike to a proper spring roll in texture and flavor. However the ground duck within was smoky, sweet and hearty. That's caramel ice cream and pound cake on the right. 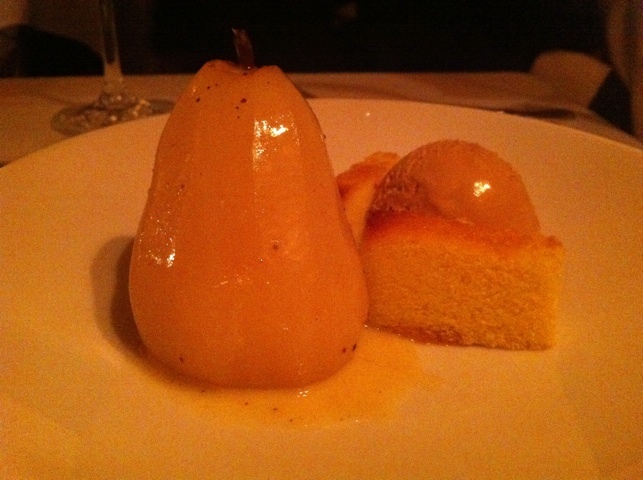 For dessert, we went overboard with the spiced pear. It is served with a caramel ice cream and a pound cake. It’s very decadent. Look, the meal was delicious. The appetizers were around $15 and $12, the mains $27 and $38 (for the lobster). With four drinks (two each), the whole thing clocked in at around $164. So it’s not the cheapest meal in NYC, but it seems like a bargain, considering the extremely high quality of the food. If you’re looking for a cozy place to mark a special occasion, perhaps an anniversary or something, you’d do well here without breaking the bank. An old favorite. My last meal there cost exactly the same amount- and I considered it a fair bargain. The only thing I’d add is that it’s particularly great if you get to sit in the “parlor room” on the second floor- sitting by the window in a fine NYC brownstone while JG and friends are in the kitchen is hard to beat! Quite correct about the second floor parlor seating. Forgot about that – thanks for pointing it out.